The Sandwich Police Department consists of sixteen (16) full-time sworn police officers, varying sworn part-time officers, seven (7) full-time civilian employees, and three (3) part-time civilian employees. Each Division and associated Sections are essential in providing the City of Sandwich with quality police service. The Sandwich Police Department is led by Chief of Police James W. Bianchi and four (4) full-time sworn sergeants with each sergeant assigned to a patrol shift. The police chief is appointed by the mayor. Patrol officers are promoted to sergeant after participating in written and oral testing. Participants who successfully pass both phases of testing are placed on a sergeant eligibility list. It is from this list that the Sandwich Police Commission appoints a patrol officer to fill a vacant sergeant position. Sergeants fulfill administrative roles in areas such as scheduling, fleet management, training coordination, facility maintenance, policy writing, K-9 Unit coordination, and other projects as determined by the Chief of Police. A civilian Support Services Supervisor oversees the civiliation component of the police department including the Communications Section and Records Management as well as assists in policy writing, scheduling, training, fullfilling FOIA requests and other projects as determined by the Chief of Police. The Sandwich Police Department has an authorized strength of eleven (11) full-time sworn patrol officers. Eight (8) full-time patrol officers and a varying number of part-time officers are assigned to the Patrol Section. Officers assigned to the Patrol Section vigilantly patrol the City of Sandwich in an effort to detect and prevent crime. On a daily basis our officers assist citizens, assist other law enforcement agencies, participate in the schools, and enforce criminal and traffic law. All patrol officers are required to complete a minimum of 400 hours of basic law enforcement instruction at a certified Illinois police academy. When a new officer returns from the police academy, the officer participates in a 12 week field training program where the officer is paired with several Field Training Officers (FTO's). After the officer successfully completes the field training program he/she is authorized for solo patrol. A new police officer is continually reviewed during a 1 year probationary period to ensure that the officer is progressing properly and meeting department standards. Patrol officers are sent to specialized training for DUI detection, investigative techniques, breathalyzer operations, and other classes based on availability. Sandwich Police Officers wear many hats and often play dual roles in the department. Our officers hold specialty positions such as DARE Officer, Evidence Custodian, Crime Scene/Evidence Technician, K9 Officer, Range Master, Firearms Armorer, Field Training Officer, etc. Three (3) full-time patrol officers comprise the Investigations Section, one (1) as a general assignment detective, one (1) assigned as an Inspector with the Kendall County Cooperative Police Assistance Team (KCPAT), an Illinois State Police narcotics task force, and one (1) as a School Resource Officer dedicated to Sandwich CUSD #430. Our investigatoris are members of the DeKalb County Major Crimes Squad, a multijurisdictional countywide initiative that is periodically activated to investigate the most serious of crimes. Criminal investigations initiated by the Patrol Section that require considerable time and effort are assigned to the Investigation Section. By having members of the police department dedicated to investigating complex and time consuming cases, it allows members of the Patrol Section to remain "on the street" responding to the needs of the community in a timely manner. Members of the Investigations Section participate in monthly multi-jurisdictional detective and gang meetings to share and obtain intelligence with surrounding law enforcement agencies. The Sandwich Police Department employs one (1) full-time support services/administrative clerk, four (4) full-time telecommunicators, and a varying number of part-time telecommunicators. A great asset to the department, the support services supervisor is also trained as a telecommunicator and supplements the Communications Section when the need arises. The Support Services Division is also available to properly install car seats! This wonderful community service is available Monday - Friday (excluding holidays) during normal business hours by appointment only. Please call 815-786-7261 for more information. The support services/administrative clerk assistant engages in various support and administrative assistance including maintaining an organized filing system, managing payments, assisting in budgeting, preparing reports, communicating with state's attorney's offices, and much more. The Sandwich Police Department maintains its own communications center staffed 24 hour a day, 7 days a week, 365 days a year. The Communications Section receives 9-1-1 calls from residents in the City of Sandwich as well as surrounding areas. Our telecommunicators are responsible for answering emergency and non-emergency calls for service and dispatching Sandwich Police units accordingly. Sandwich PD telecommunicators are trained in L.E.A.D.S. and sent to specialized training classes yearly. All emergencies that warrant an ambulance and/or fire department response are transferred to KenCom in Yorkville, Illinois for immediate dispatch. The Sandwich Police Department has implemented a civilian community relations coordinator that is responsible for seeking grants, maintaining the police cadet program, administering the city's adjudication process, and much more. For more information regarding our community oriented initiatives please contact Community Relations Coordinator Mike Nelson at 815-786-7261. During the summer of 2015 the Sandwich Police Department started a Cadet Program. The goal of the Cadet Program is to allow students the opportunity to see if they want to pursue law enforcement as a career. We started off by giving them some of the common tasks that an officer faces on a daily basis. Then as they progressed, they went on ride alongs to see officers working in the field and experience some of the calls received on a daily basis. Now our cadets help with functions not only in our community, but they have also assisted other agencies in the surrounding communities. 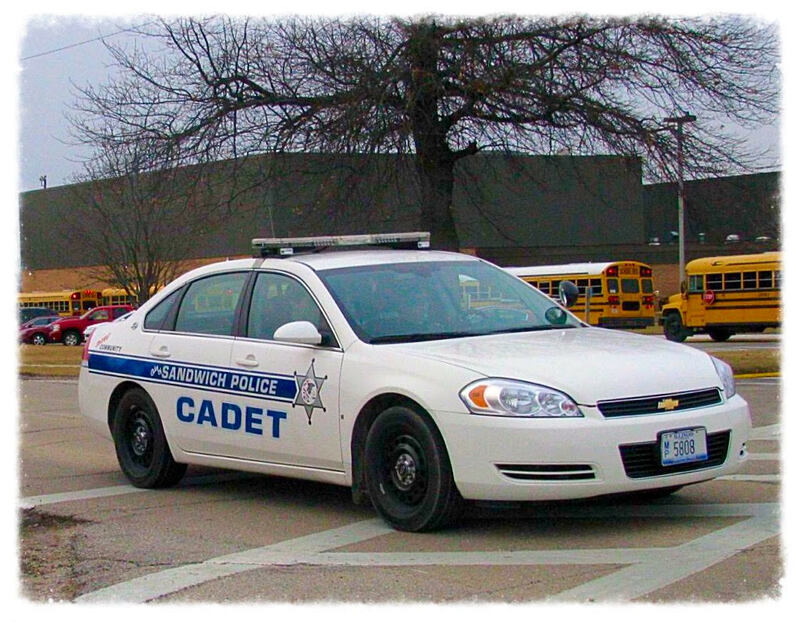 After meeting training requirements, cadets are authorized to perform the following tasks: traffic control, school patrol, extra patrols, vehicle lock outs, office related tasks, assist the range master, works with officers in the schools, assists with community relations events, assist other law enforcement agencies with similar tasks, and other activities as assigned. Copyright © Sandwich, Illinois Police Department. All rights reserved.